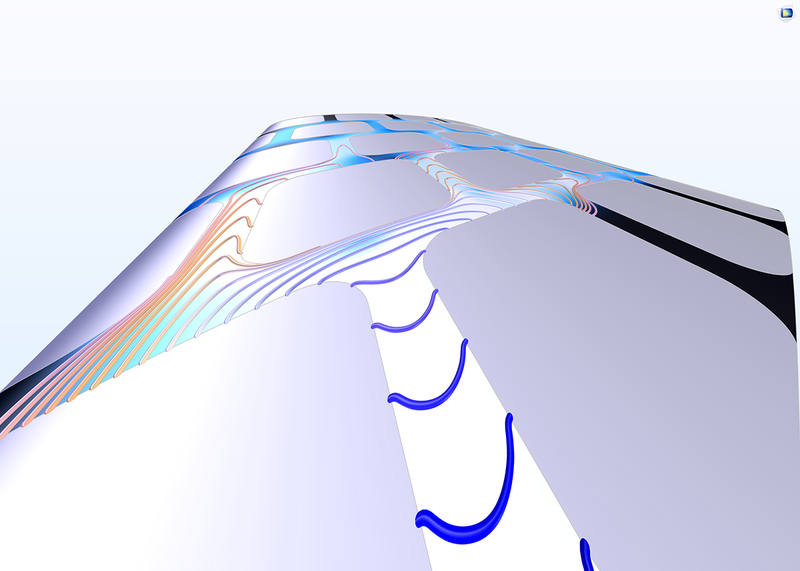 For users of the CFD Module, COMSOL Multiphysics® version 5.3 brings a new v2-f turbulence model for simulations over curved surfaces, an algebraic multigrid solver (AMG) that vastly improves solving CFD simulations, and automatic treatment of walls to provide high accuracy in turbulent flows. 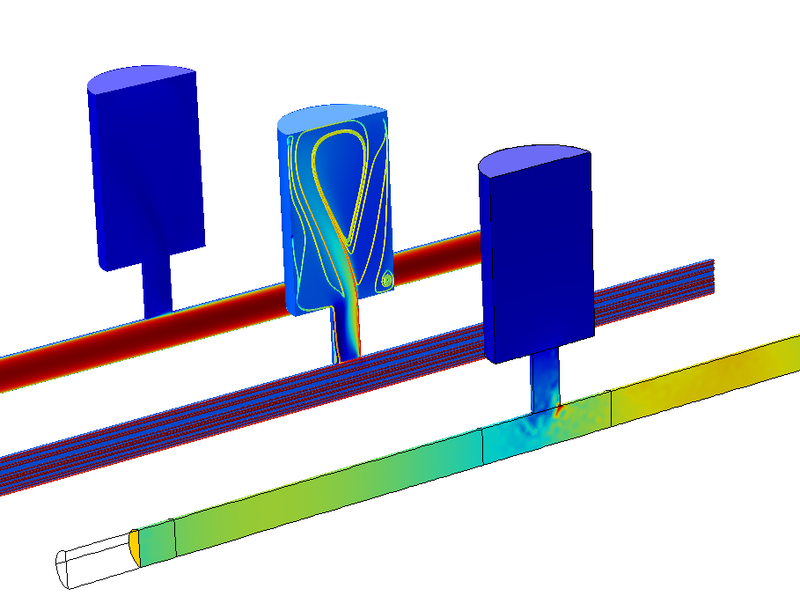 Browse these and more CFD Module updates and features below. The v2-f turbulence model, which is an extension of the k-ε turbulence model, provides highly accurate solutions for flows with strong turbulence anisotropy. An example of when to use this turbulence model over others is when flow occurs over curved surfaces, such as in the cyclone separator presented in the image. This model successfully captures the flow pattern, including the free vortex, which is inherently difficult in cyclone simulations and is largely impossible to perform with standard two-equation turbulence models. 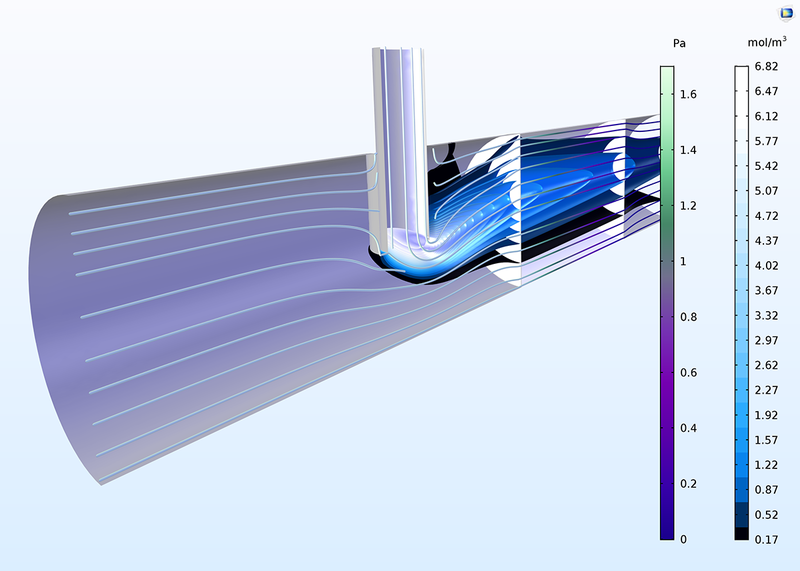 Streamlines and pressure field (left) and vortex core (right) in a model of the flow in a cyclone separator. Streamlines and pressure field (left) and vortex core (right) in a model of the flow in a cyclone separator. 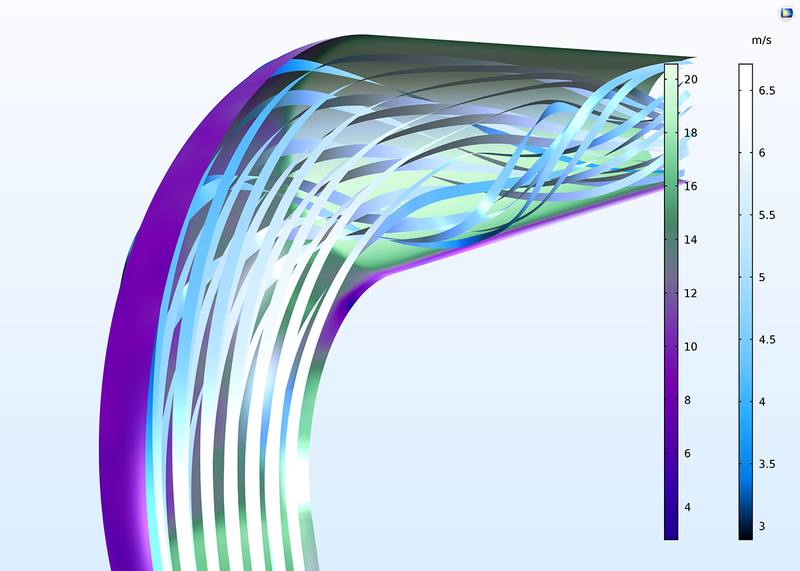 New functionality for wall-bounded turbulent flows allows for the automatic switching between a low Reynolds number turbulence model formulation and wall functions when solving your model. This functionality is available and is selected by default for the following turbulence models: Algebraic yPlus, L-VEL, k-ω, SST, Low Reynolds number k-ε, Spalart Allmaras, and v2-f. If the mesh resolution close to the wall is adequate, then a low Reynolds formulation is used. Yet, when the mesh is too coarse, wall functions together with the selected turbulence model are automatically used instead. Switching between the two can occur in the same model. 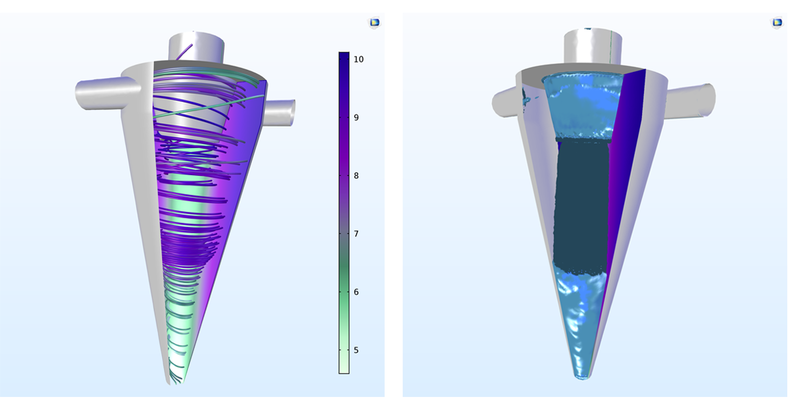 The functionality for automatically treating walls for turbulent flow provides the accuracy allowed by your mesh resolution, while also inheriting the robustness that is provided by wall functions. The wall's mesh resolution in viscous dimensionless units (color legend Aurora Borealis, in this figure) determines the functionality for automatically treating walls — either a low Reynolds turbulence model formulation or a wall function. The lower the value of the viscous dimensionless units, the higher the wall's mesh resolution and applicability for using a low Reynolds turbulence model formulation. The wall's mesh resolution in viscous dimensionless units (color legend Aurora Borealis, in this figure) determines the functionality for automatically treating walls — either a low Reynolds turbulence model formulation or a wall function. The lower the value of the viscous dimensionless units, the higher the wall's mesh resolution and applicability for using a low Reynolds turbulence model formulation. A successful strategy for modeling turbulent flows is to start with a relatively simple turbulence model to gain an understanding of the system and for troubleshooting the model setup. Once you have a working model that gives reasonable results, a possible next step would be a more sophisticated — and maybe more computationally expensive — turbulence model for higher accuracy. For this purpose, we have introduced a new functionality that "translates" the meaning of the turbulence variables from one turbulence model to another one. This means that you do not have to redefine the domain settings and boundary conditions for a second turbulence model. Additionally, you can use the existing solution as an initial condition for increased robustness and faster conversion in the solution of your second turbulence model problem. Use of the alternative geometric multigrid (GMG) solver usually requires several mesh levels to be considered, which can create issues when trying to mesh and solve models with varying geometric details of different sizes. The SA-AMG solver only requires one mesh level, making the meshing process much easier and the solving process much more robust for large problems and "difficult" geometries. 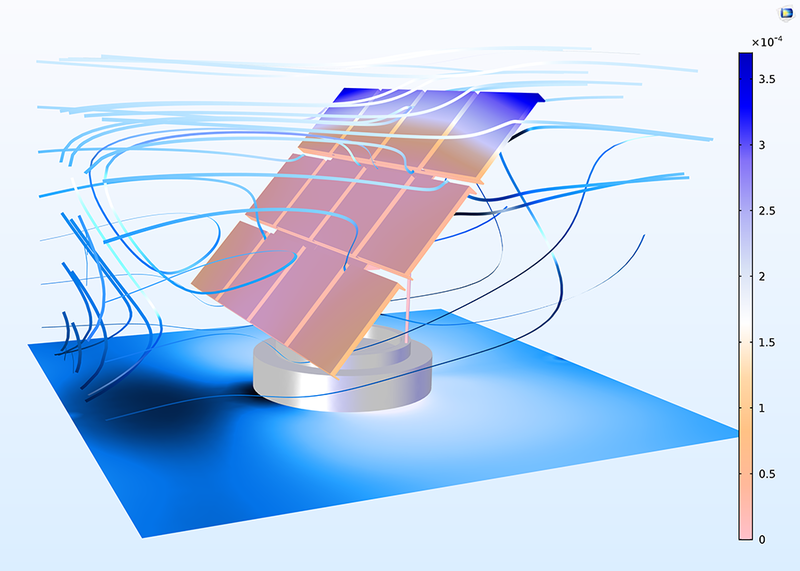 Fluid flow past a solar panel and the pressure distribution on the surface of it undergoing fluid-structure interaction behavior. 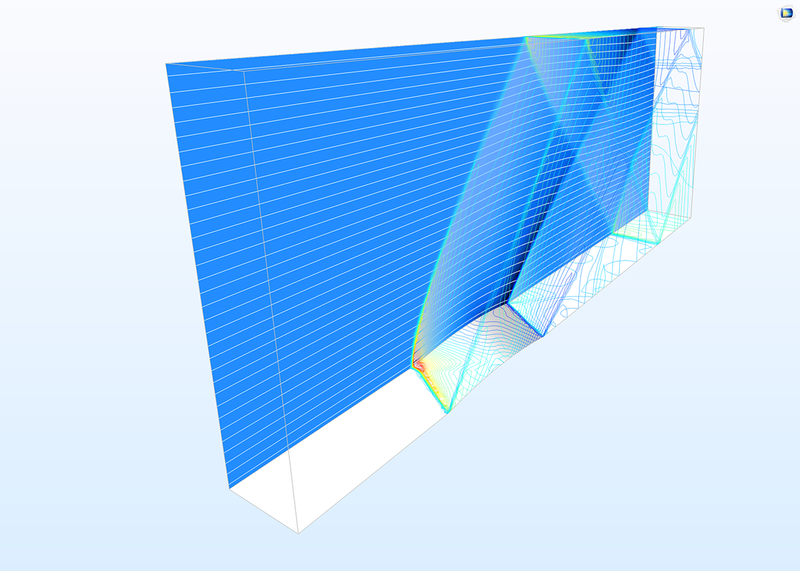 The difference in the dimensional sizes of the supporting struts and beams against the surrounding air domain leads to challenges when meshing the model. With the SA-AMG solver, only one mesh level is required for the solution process, which is far faster and easier to achieve compared to the solution process with the GMG solver, which requires three mesh levels. 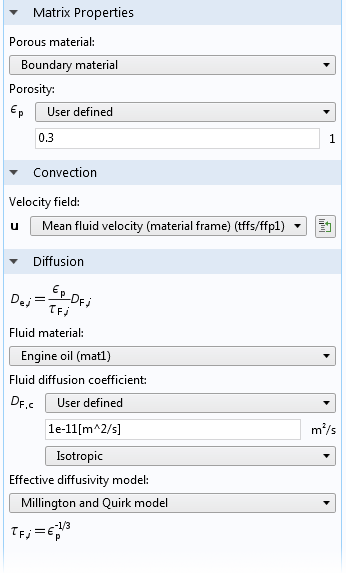 The High-Mach Number Flow interface combines the momentum equations with the energy equations for inviscid flows close to or above Mach 1. This has now been improved for better accuracy through developing a formulation of the momentum equations. 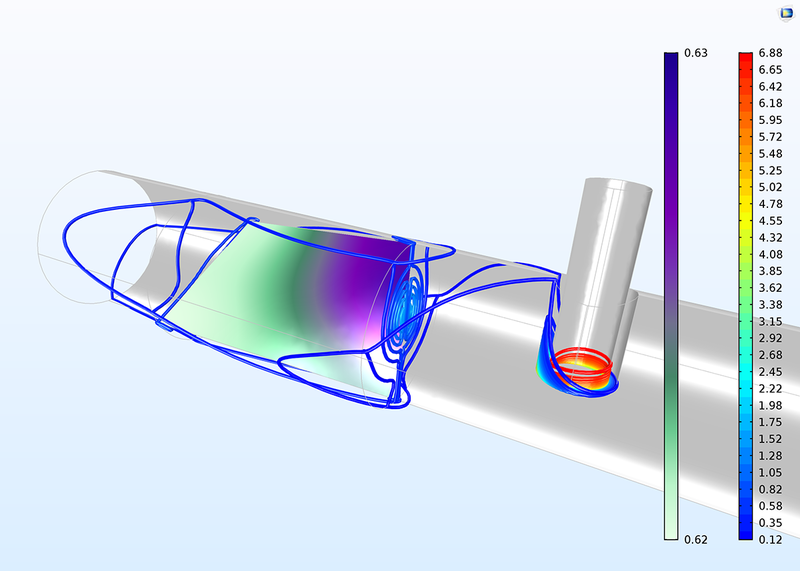 In addition, three new tutorial models illustrating supersonic flows are introduced in the Application Library: The Euler Bump 3D, Expansion Fan, and Supersonic Ejector tutorials. These examples all reproduce results from scientific studies. Shock diamonds in the velocity field of supersonic flow from a supersonic ejector model (left). Shock diamonds behind the engines of an SR-71 jet (right); image credit: NASA. 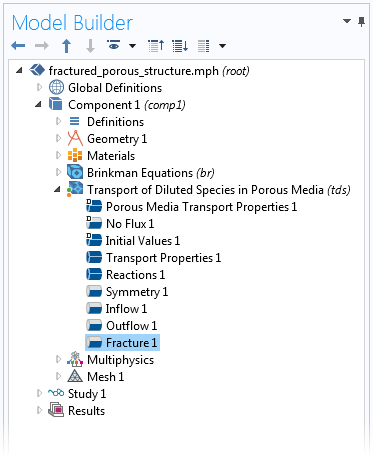 NASA does not endorse the COMSOL Multiphysics® software. Shock diamonds in the velocity field of supersonic flow from a supersonic ejector model (left). Shock diamonds behind the engines of an SR-71 jet (right); image credit: NASA. NASA does not endorse the COMSOL Multiphysics® software. 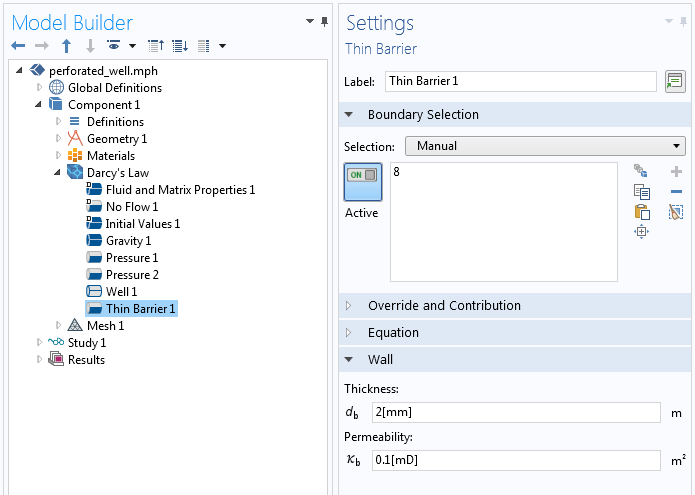 In the Darcy's Law and Richards Equations interfaces, you can now define permeable walls on interior boundaries with the Thin Barrier boundary condition. These internal boundaries are typically used to represent thin, low-permeability structures. With the Thin Barrier boundary condition, you avoid meshing thin structures like geotextiles or perforated plates, thus reducing computational time and resources. The mean flow is calculated with the SST turbulence model for Ma = 0.05 and Ma = 0.1. The acoustic problem is then solved using the Linearized Navier-Stokes, Frequency Domain (LNS) interface. The mean flow velocity, pressure, and turbulent viscosity are coupled to the LNS model. Results are compared to measurements found in a journal paper and the amplitudes and resonance locations show good agreement with the measurement data (as seen in the 1D plot). The balance between attenuation and flow effects needs to be modeled rigorously in order for the resonance location to be correct. Transmission loss calculated using the LNS model for three flow configurations. 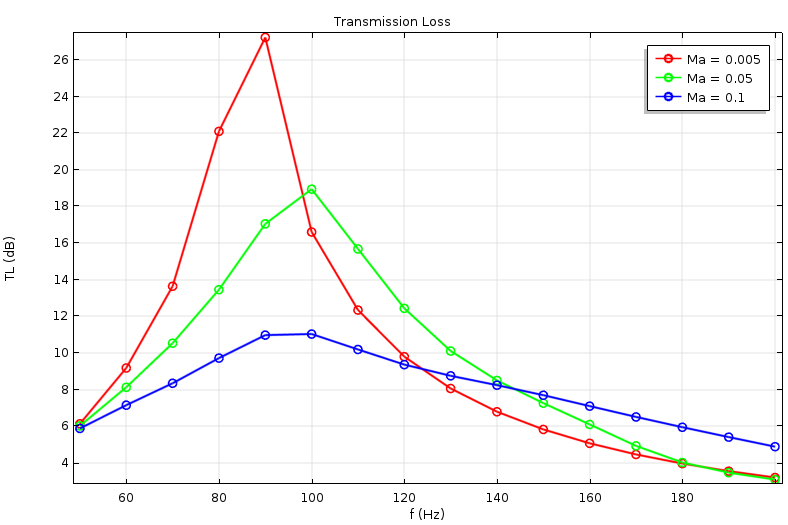 Transmission loss calculated using the LNS model for three flow configurations.